There are so many different types of tents available today, each catering to slightly different needs – whether it’s a huge canvas tent you need for a car camping trip or the lightest tent possible for your next backpacking adventure. And it’s tough to find the ones that are truly made in America. We did the research to break it all down for you and find the manufacturers that are making the best American-made tents. Check out our recommendations below, along with full details on each of our top picks, what we liked and didn’t like about each one, and all of the factors that went into our research. On the whole, there are a lot of great companies making high quality tents right here in the USA. These tents ranged from common canopy tarps to heavy duty all-weather camping tents and everything in between. We researched each one and found the 7 companies that are producing the best tents out there. Take a look at our top picks below! Take a deeper look at details for each of our recommendations, along with what we liked and didn’t like about each one. Protective and light, the Echo II tent from Hyperlite Mountain Gear is a great one-person option for your next camping trip, and many others after that. It comes with the protective tarp, detachable mesh insert to keep out bugs, and a “bathtub” floor to keep out water and insects. 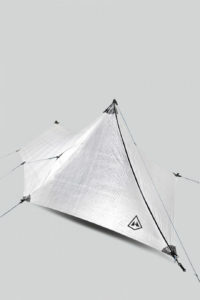 They use Dyneema composite fabrics to build the tarp, which is not as durable (in the long term) as some other materials, but is very protective against harsh weather and very lightweight. Weighing in at about 1.8 lbs, you’ll barely even notice it’s there when you throw this tent in your pack. We found the bug shelter insert that goes inside the tarp to be especially easy to set up and it also does a good job of concealing the bugs when they land on it – you can barely see them. Overall, great lightweight tent option for anyone. The Springbar Highline 6 Tent is the ultimate family car camping tent for pretty much any season. This thing is huge – at 100 square feet, it can sleep 6 people comfortably and has a standing height of over 6 feet, so you can easily move around while you’re in it. The tent is also incredibly easy to pitch – you can do it with one person, but we found that it’s a little less hassle if you have a couple of extra hands. The Highline is made from a Hardyduck canvas material, which is super strong, water resistant, and also helps prevent mold and mildew. Bottom line, you won’t need to purchase another tent for a very long time. The windows that you see on the front are great for ventilation, and they also have a mesh cover so you don’t let any bugs in. 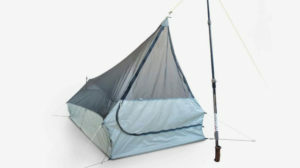 The tent comes with a shade awning, stakes, storage bag, and ropes to tie everything down with. Remember, this is a car camping tent – it’s too large and weighs way too much to try and fit in a backpack. Only a limited lifetime warranty – will offer repair options and replacement parts, but full replacements are tough to come by if you have any issues (we don’t think you will though). The Clark NX-270 hammock was the best we saw on the market today, primarily because of it’s protection, breathability, strength, and ease of setup. It has a couple of layers of protection on the top of the hammock, starting with a No-See-Um mosquito netting that keeps you well protected and is great during the summer months. For colder conditions, you can easily zip the WeatherShield layer on top of your netting to provide additional protection and warmth. We found that is easily held up to rainy and snowy conditions. The interior of the hammock is roomy and lined with 6 pockets where you can store gear and also double as insulators when it’s chilly outside. The ropes used to tie up the hammock are water repellent and very sturdy (1,700 lb test). 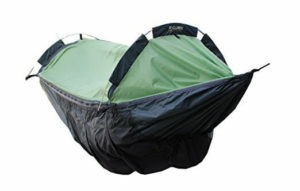 Overall, a great choice for hammock camping during any season. This Warmlite tent is also really easy to set up, even in bad conditions. All you need is the two curved poles and three stakes, which are all provided with the tent and easily slip into where they need to go. The adjustable ventilation system is also nice – it really helps control the temperature of the tent, especially since it’s a bit warmer than most to begin with. Keep up the great work, Warmlite! Slightly expensive, but typically these types of tents are reserved for your serious alpine climbers. Sewn in Seattle, Washington, the Tarptent StratoSpire 1 is a great 1-2 person tent, and comes with an attachable “side car” that is still underneath the tent’s protection and perfect for any dog you bring camping with you. It took us just over 2 minutes to get it set up and attached to the larger tent – it can fit in either vestibule (opening) on each side of the tent. We also really liked the StratoSpire shelter itself – it uses a dual trekking pole support that doesn’t interfere with a pretty spacious interior and the exterior holds up well to inclement weather. It is very easy to set up and the interior barely gets wet when setting it up or taking it down (if it’s raining). 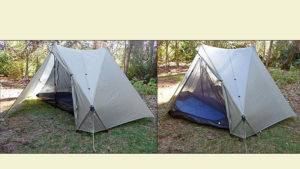 The Silpoly Net Tent from Yama Mountain Gear is great for anyone needing a bug shelter on a camping trip where you know you’ll have some nice weather. The No-See-Um netting keeps the insects out and the tent comes with a nice (thicker) flooring that keeps moisture out from the ground below. The netting is very breathable and easy to get in and out of. Setup is also simple – all it requires is a trekking pole, or the optional tent poles if you don’t have one. If you’re looking for more of a full shelter system, you can also get the 1P or 1P+ Cirriform from Yama Mountain Gear, which pairs well with the Silpoly Net Tent so you can have some options for different seasons of the year. Perfect for minimalist campers, canopy tarps are simple – keeps you dry from any potential rain or snow from above, and you’ll take care of the rest. 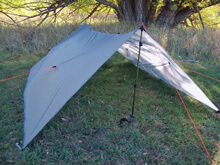 The Catenary Cut Ridgeline tarps from Bear Paw Wilderness Designs are the best we’ve found and a great example of the versatility and strength that you need in a A-frame tarp setup for your camping trip. They can be used for a simple on-ground setup (like shown in our photo) or used above ground for some additional protection over your hammock. Overall, these are a really high quality line of tarps that shined for their material strength and ease of setup. Material strength and durability was a big factor for us in our research. After all, this is camping we’re talking about – your tent needs to be able to weather the elements and a bit of rough treatment every once in a while. This comes down to not only what material is used, but how the tent is sewn as well. Size is really important, not only for how many people sleeping in your tent, but also for gear, pets, and just general comfort. 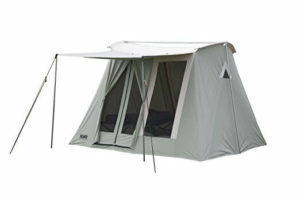 We really liked tents that had a roomy interior while minimizing weight. Remember, you should typically subtract one person from what the tent says it can actually hold. So, if it’s a two person tent, typically pretty comfortable for one person and their gear. Of course, we want to make sure you’re getting the best tent for your money. After all, we’re consumers too! We eliminated several tents where we felt like the quality of the product did not live up to its expensive price tag.